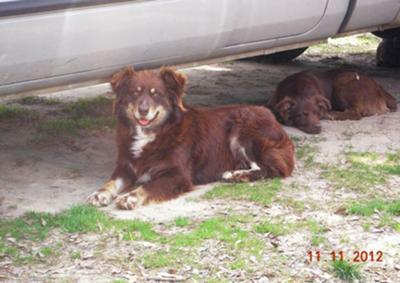 Owning and breeding Aussies is one of the joys of my life. Their intelligence, loyalty and beauty is unsurpassed. I purchased Romeo, a beautiful red tri when he was two. Owning Aussies I have come to realize they are all individuals, but he was so different, I began to wonder if he was a bit slow. So goofy and adoring of me I would sometimes turn and stumble over him. I then began to notice he was watching my every move and trying to understand exactly what I wanted him to do. He began by learning to protect the smaller less aggressive puppies. Soon anyone who was too pushy got a quick smack with his paw or a low growl. He is so orderly he will break up a fight between unfair rivals. Place himself between children and younger Aussies who have not quite learned not to herd them yet. I have now decided he is one of the most intelligent I have run across to this date. Here he is with one of his adoring dachshund fans Floyd. That's a trick I haven't quite accomplished, a trainer is the only answer I have, Lots of people who buy my pups send them to trainers immediately to learn the commands for herding. I just stay on mine continuously and use the words off and back and the older ones teach the younger ones. Those two words keep mine under control. On occasion I get a young male that doesn't respond and every time he doesn't he gets a time out in the kennel and that will make him pay attention the next time. Females seem to pick up quicker. They are highly intelligent and they think they are doing good it is in their soul and bred into their bones and they just want to please you and their brain tells them that is how. Too bad it drives us crazy. How on earth do you train/teach them not to herd? Our 4 year old herds everyone and everything. Aussies are just the greatest, aren't they? 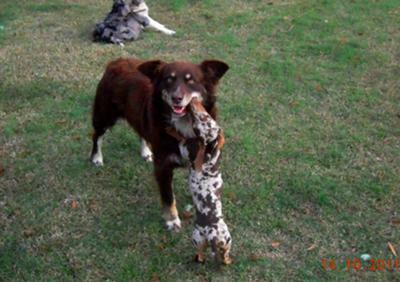 My old dog, Nellie, would train all the pups not to chase the cats. Nellie has been gone for almost 2 years now and Bryn-- who is almost 2--chases the cats because Nell was not here to train her. I miss my crazy girl!